SAN FRANCISCO—A Falun Gong practitioner was cursed at and attacked for his religious beliefs in San Francisco’s Chinatown on Monday. Jein Shyue spent Memorial Day in Chinatown to help inform passersby about the persecution of Falun Gong in China. Falun Gong is a spiritual discipline practiced by up to 100 million in China for its health benefits and moral teachings. For 14 years the Chinese communist regime, which feared the popularity of the practice, has been harshly persecuting its adherents. Jein, who is an engineer from San Jose, was standing on the corner of Grant and Washington Street in central Chinatown, a spot where Falun Gong practitioners have been handing out flyers for years. An elderly man of Chinese origin, holding a sign with Chinese communist propaganda, suddenly appeared and started cursing the Falun Gong practitioners, including Jein. Jein started to film the incident with his phone. 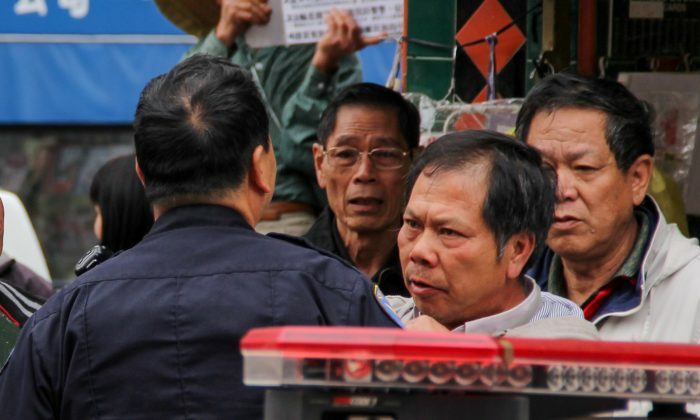 The man, named Jingjun Chin, has a record of harassing Falun Gong practitioners. He was found guilty by a neighborhood court on Aug. 31 last year for assaulting a female Falun Gong practitioner in Chinatown. The court also handed him a restraining order. When Jein started filming, two other Chinese men came up to him. Jein’s phone recording showed how one man lunged at his phone as soon as Jein pointed it towards him. Then an object hit his face with a strong force, but Jein said he is unsure what it was. Jein’s right eye sustained a hemorrhage from the impact. “I got hit and then I lost my glasses, I can’t see well without my glasses. There were two people around me, so I was surrounded,” Jein said. As he was trying to find his glasses—Jein is strongly near-sighted—a growing group of people gathered around him cursing at him. “I was just trying to look for my glasses, and they thought I was escaping. So people grabbed my collar,” he said. Jein said he called 911 after he got up. Dr. Wang Juquan, a Falun Gong practitioner who was handing out flyers across the street from the incident, witnessed how Jein was surrounded by several people who were trying to hit him. “I ran over to ask them to stop beating, but I was also pushed away several times by them,” she said through a translator. The old man who hit Jein’s phone sustained a bruise to his head as a result of the chaos that ensued, though it is not clear how. The incident comes as the latest in a string of hate crime incidents in Chinatown. Ever since the start of the persecution of Falun Gong in 1999, the Chinese regime is known to have extended its hate campaign against the practice overseas through its embassies, consulates, and affiliated organizations. Last year alone there have been at least ten incidents that involved violence against Falun Gong practitioners.